The recent deployment of 10,000 marines to Afghanistan's embattled Helmand province underscores the Obama administration's desire to thwart Taliban forces and its fertile opium trade. This move came as President Hamid Karzai was all but called out this week by the White House amid international allegations of corruption and voter fraud. Washington has long been frustrated with Karzai's near-total inability to staunch the flow of drugs—one of the Taliban's principal funding sources. This was also echoed last month by a U.N. report citing Afghan opium—50 percent of which emanates from Helmand—as causing more deaths than any other drug worldwide. In all, Afghanistan produces 92 percent of the planet's opium and, thus, 80 percent of its heroin. Such violence, corruption, opium production, and associated Taliban influence need not continue to flourish and eviscerate Afghanistan as a narco-state—and the main battlefield in the war on terror. Instead, a dramatically increased, concerted, systematic and humanitarian intervention by international relief organizations—with greater protection from U.S. forces and their NATO allies—could guide Afghans toward legitimate, sustainable crops. Karzai, predictably, has a history of rejecting forced poppy eradication—much to the chagrin of Pentagon and White House officials. In Helmand, for instance, memories linger over an incident in which more than 2,000 poppy farmers nearly overran police in the provincial capital of Lashkargah, leaving eight dead and 35 injured not long after American-led forces routed Taliban fighters in 2001. Elsewhere in Afghanistan, National Police officers have been met with snipers and explosive devices in other eradication attempts. None of this put a dent in poppy production, of course: within five years, according to the statistics calculated by a program manager at one relief agency, Helmand had produced some 4,400 metric tons. This campaign would hardly clean up Karzai's cabinet. But with more than 50 NGOs—with mandates ranging from mine clearance to food assistance—active in Afghanistan, much has already begun. But these groups are both under-funded and under fire. This would be improved were they able to work more openly with farmers to gradually cease their opium production under more heightened security. 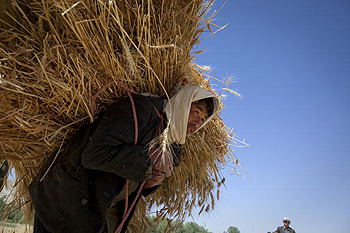 Already they have demonstrated that, with the right kind of assistance, Afghan farmers can live off licit crops like wheat, vegetables, fruit trees, sesame, flax and other types of alternative crops based on their geographic location and seasonal temperatures. But the biggest challenge they may all face could be found in Washington. That is, crop eradication would not happen overnight—while the perils of forced eradication are all too clear, despite the fact that they are still being debated in Washington. Inevitably, any overseas project involving an outright relationship between U.S. dollars and Afghan poppy production will be greeted with powerful Beltway indignation and resistance. But the alternative for long-suffering Afghan farmers being discussed in Washington—simply eliminating poppy crops outright—would be far more damaging to both U.S. and NATO troops, Afghan civilians and the war effort as a whole. Another stated cause for concern has been U.N. reports that the Taliban has stockpiled more than 10,000 tons of opium. But, if anything, this should be seen as a call to arms—a tactic that, surprisingly, has benefited the U.S. in the past. Moreover, whatever the Taliban decides to do with its stockpiled drugs—whether flood the international market, or simply sell off its reserves slowly over the long term—it stands to lose out. Either option will invariably shrivel profits for local Afghan poppy farmers, thus planting the seeds for domestic upheaval. This is peculiar, since the Taliban has made this type of mistake before. In October 2001, the militants banned opium sales and production to cash in on another reserve supply. But by alienating poppy growers, Taliban fighters lost a critical moment to mobilize public support in the face of American and Northern Alliance attacks that ousted them from power after 9/11. But as long as there is easy money to be made by the Taliban from poppy, a steady, mature introduction of alternative crops that the militants have less control over time will enhance weakness. There are reasons for hope: for years before opium thrived in the power vacuum left by the Soviet occupation, for example, cotton was a staple crop that yielded profits; Afghanistan's mineral wealth, meanwhile, remains almost completely undeveloped. In the end, any serious recovery for Afghanistan will require a slow, steady commitment—especially if the U.S. and its NATO allies want to help it achieve a more prosperous and peaceful future. But there will be no quick fixes: though deeply unpopular, the Taliban has proven itself remarkably resilient—not least because of their creation and continued support by the ISI, Pakistan's intelligence agency. If history is anything to judge by, foreign interventions in Afghanistan based on military campaigns alone have left tragedy in their wake. Just ask the Afghan people. Or the thousands of Red Army soldiers who hastily withdrew in defeat after nine years of Soviet occupation in 1988. Or the victims of September 11th. Joseph Kirschke is a foreign affairs analyst for World Politics Review, an online news website.